Okura Nikko Hotel Management Co., Ltd., a subsidiary of Hotel Okura Co., Ltd., announced today its conclusion of a contract with Meieki Management LLC to manage Nikko Style Nagoya, the first hotel under the new upscale, select-service Nikko Style brand, which will open in 2020. Nikko Style Nagoya will be located in Nagoya’s popular Meieki district, which combines offices, retail outlets and other downtown conveniences, including Nagoya Station, within the fast-redeveloping Chukyo metropolis that extends well beyond Nagoya. Nagoya’s Meieki district is a principal transportation hub with intersecting JR, Nagoya Railroad and Kintetsu Railway lines. In recent years, Meieki has become the main gateway to the Nagoya metropolitan area and surrounding region. The district’s distinctive atmosphere is defined by its highly regional character, including historic Yanagibashi Central Market, the local “pantry of citizens.” Chubu Centrair International Airport is within easy reach and is expected to bring in many more overseas visitors as Japan’s inbound tourism continues to surge. Nikko Style Nagoya will offer 191 rooms, a communal lobby, all-day dining and a fitness gym. This will be Okura Nikko Hotels’ first select-service lifestyle hotel targeting at a new customer base. The upscale facility will be specifically geared to satisfying the needs and preferences of millennials interested in culture, health, the environment and creative hotel experiences. It is forged from the brand concept of a hotel that fascinates people by offering them new travel styles and experiences. 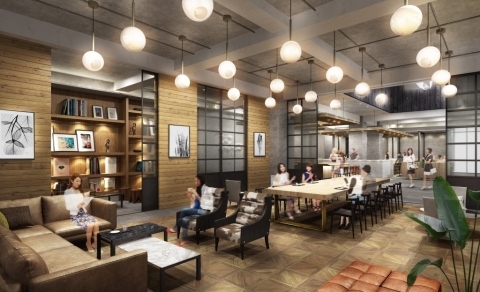 One of the hotel’s many appealing features will be its communal lobby, which is designed to facilitate interaction among hotel guests, local people and other visitors. Additionally, a special event area in the lobby will provide a unique space for culinary events featuring tasty local ingredients, workshops on Nagoya’s distinctive cuisine and performances by local musicians, allowing guests to absorb Nagoya culture and experience its charms even before venturing outside. All-day dining will include a tempting mix of all-round and local Japanese cuisine, including fresh, high-quality produce supplied by local farmers, as well as representative local beers and Japanese sake. Standard rooms will offer an above-average 30 m² of floor space with 5 meters of frontage, providing spacious living areas and bathrooms allowing enhanced relaxation. Interiors will incorporate motifs inspired by the traditional crafts of Nagoya, imbued with Japan’s world-famous manufacturing culture, and in the same spirit, Nikko Style Nagoya will provide their own original amenity products which are gentle on the skin and environmentally friendly. The 24-hour fitness gym will invigorate guests with an exhilarating open design enhanced by an extra-large picture window. As a people-friendly and earth-friendly hotel, Nikko Style Nagoya will offer guests environmentally friendly choices such as the option to decline replacement towels or bed linen. The development of the hotel facilities is being carried out by Support 27 LLC. And ORIX Real Estate Investment Advisors Corporation performs asset management and project management work, which has been commissioned by Support 27.